While this mustang may look conservative form the outside, it is highly optioned out and well documented! Under the hood is the famous "Thunderbird Special" 390 V8 mated to the C-6 select shift automatic transmission. Only 4,403 two door hardtops were made with this engine. This is a very honest mustang equipped mostly will all original parts. The current engine is not the original 390, however the original number matching motor does come with the car separately (additional shipping charges). The interior is in outstanding shape and appears to be unrestored. The dash, door panels and bucket seats do show some minor wear and appear to be very authentic ivy gold pieces. This mustang is extremely comfortable, drives smooth, sounds great and to top it all off is extremely original and well taken care of over the course of its life! The 1967 model year Mustang was the first redesign of the original model. 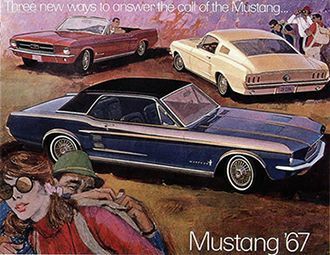 Ford's designers began drawing up a larger version even as the original was achieving sales success, and while "Iacocca later complained about the Mustang's growth, he did oversee the redesign for 1967 ." The major mechanical feature was to allow the installation of a big-block V8 engine. The overall size, interior and cargo space were increased. Exterior trim changes included concave taillights, side scoop (1967 model) and chrome (1968 model) side ornamentation, square rear-view mirrors, and usual yearly wheel and gas cap changes. The high-performance 289 option was placed behind the newer 320hp, 390 cubic inch FE engine from the Ford Thunderbird, which was equipped with a four-barrel carburetor. During the mid-1968 model year, a drag racer for the street could be ordered with the optional 428ci Cobra Jet engine which was officially rated at 335 hp all of these Mustangs were issued R codes on their VINs.